Thanks to our overseas move, I’ve spent more time in medical offices in 2012 than I did in the ten years prior. Dental, optical, general medical: you name it I had it checked. None of it because I was ill, mind you. I had hoped the appointments would end when we arrived, but a minor problem had me heading to a specialist in August. Luckily the Embassy refers us to English-speaking physicians so language is not a barrier. But there are surprising differences in our systems. In Italy, staff is limited. The doctor met with me alone. Completely alone. There was no one else present, primarily I assumed because it was the end of the Ferragosto holiday period, but the experiences of friends – and one appointment Ric had – point to a trend: There is not a lot of support staff. One American doctor who is familiar with the situation here told me “they can’t afford a lot of extra people in the practice.” Still, there are not many American physicians who would treat a woman alone in his office, no one else even in shouting distance. There would be fear of allegations of inappropriate behavior. Maybe that happens here, too, but it doesn’t seem to paralyze. It certainly did not bother me. It’s all about conversation. There were no forms to fill out or extraneous medical history. Just info pertinent to the problem at hand. Maybe that was because I was referred in and a foreigner. (As an aside, I can’t even buy coffee at the Nespresso Store without having given my codice fiscale — sort of like a social security number or Tax ID — and it is not uncommon to be asked your date of birth as a form of ID, almost as nonchalantly as asking for a cell phone number.) The doctor simply engaged me in conversation: What is your problem and why are you here? What’s the family history? OK, let’s take a look. Doctors do their own billing. Again confirmed by an Italian friend: yup, it’s routine if they want to get paid. I suppose this pertains only to private patients that are not on national healthcare, but imagine my surprise when I received an email from the doctor, at 8:00PM that same night, with a full report and bill. (In a future post I’ll tell you about bill payment and banking. Another cultural shift.) As if to prove it is not an anomaly, when Ric had a medical visit the doctor hand wrote an invoice and gave it to him. We were surrounded by fascinating and state-of-the-art healthcare and diagnostic technology, but the bill is written out long hand. It probably took less time to do it by hand than to submit the details to a billing department that would spew out an invoice. And neither Ric’s appointment nor mine cost nearly what one might expect from a specialist. Low-overhead = Sensible bills? Could be. Doctors answer their own phones. Ric was given a phone number – turned out to be a cell phone – by the Embassy doc and called for an appointment. The specialist answered his own phone, made his own appointment, and when we arrived we found this excellent specialist in a one-man office. Very simple, very hands on, and (we think) very effective. There is no diluting the doctor-patient conversation. Need an ECG or an Echocardiogram? The doctor will do it. No technician, no nurse, no waiting. Patients have a greater degree of personal responsibility. Need lab tests? There’s a lab up the street. Send the doctor the results when you get them. This means in all likelihood you will go for the lab test then have to go back in two days to get the results, scan them and email them to the doctor. So no charming pictures of quaint villages this post. Just an observation of unique – not bad – cultural differences. Interestingly Italy is known for having the 2nd best health care system in the world (France is first). The U.S. is #37, but we spend more. I’m sure some of the reason for the high-ranking is due to access to national healthcare, but they spend less than we do in the U.S., and rank higher. There’s no lack of knowledge or technology; these are good doctors with all the resources and expertise one would expect. But the story is not over. On Thursday I will have un piccolo intervento chirurgico (minor surgery). I’m sure I will have more stories. OK you made it through an all text post. Here’s a beauty shot bonus. I can walk by this every weekend. SIGH. 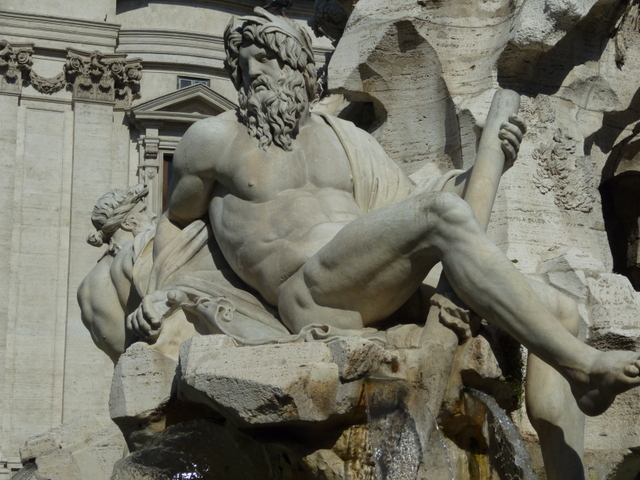 Nobody does it better: Bernini’s Fountain of the Four Rivers, Piazza Navona. Hope your procedure goes well and Ric is ok. We have alot to learn from other countries. Kim, a delayed response I am afraid. Everything is fine for both of us. 48 hours later and no pain at all as a result of the surgery. The bandages are a bugger, but will be gone in a few days. If you can’t tell already, I think the care here is first class, if a bit unmindful of privacy at times. I’m in Japan and just had a conversation last night on their health care with an American who has lived here most of his life. . . He has one card in his wallet that he shows for all health care including dentistry, can go to any doctor, premiums paid through his employer of around $2500 per year. .same for people not working and is somewhat based on income, and a simple 30% co pay for care. I asked how much his cost for a dental appointment would be, and he said $15 for teeth cleaning and check up, or a few hundred for a root canal. It is so interesting to learn all of this! Wow. I am impressed and want to know so much more! I do hope your procedure is simple and there are no concerns about recovery. Many thoughts for you and Ric. How interesting. It’s fun to hear the differences in two country’s systems. Hope the procedure goes well and can’t wait to part two of the story. Sending prayers for your surgery! Love, love, love the health care philosophy! I’ve seen that fountain! What a 6-pack, eh? Had a lovely dinner in Piazza Navona! Hi Laurel. Hope all went well with your procedure. We’ve only had one medical “experience” outside the US. In Sydney on a Saturday morning, we had to visit an emergency clinic. Went by taxi and got right into see the Doctor. Like your experience, he did everything himself, including taking time to simply visit. Received a bill on our way out and paid with our credit card. Total was $95 US, which would have been several hundreds more if we were in the US. PS, we’re on our way to Rome next week – I’ll email after we arrive. Maybe we can meet for a drink or dinner. We’ll be praying for your minor surgery!! Miss you.